Merlin's magical prowess was renown—as the son of a devil and a virtuous maiden, he had tremendous power but used it only for good. Later on it was Merlin who placed the sword in the stone—which only young Arthur could remove and become England's King. 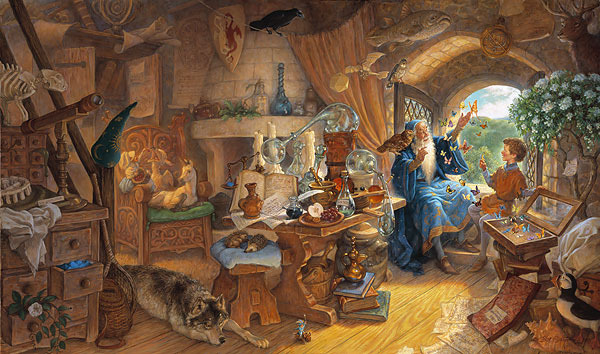 This is Merlin's room—full of exotic and marvelous portents, omens, objects and animals (can you find the owl, hedgehogs, raven, unicorn and the puffin?). Strange things are afoot here—notice how the bottles on the tables have faces and seem to be shape-shifting...and is the ink bottle writing something?